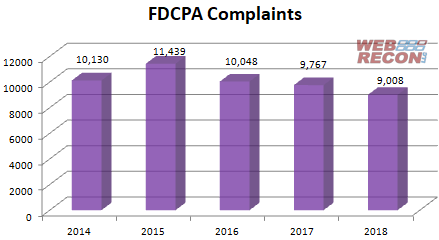 FDCPA complaints are at their lowest point since 2008, when there were 6117 lawsuits. against serial litigants? Read more Here! TCPA’s journey has been fairly symmetrical, rising every year since the beginning of the century through 2016 where it peaked at 4639 lawsuits. It has dropped each of the last two years in spite of easing regulation. Who know’s where it will end up in 2019? 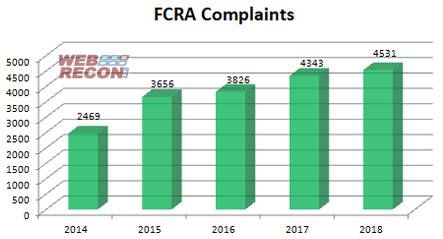 FCRA has been the big winner in recent years, rising every year since 2011. It is now the only consumer statute that has continued to increase in suits filed. 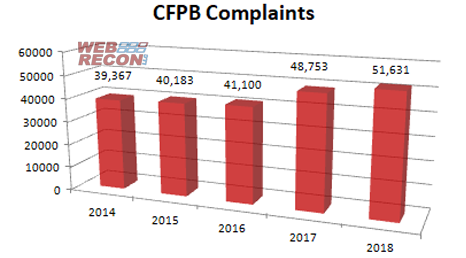 CFPB complaints have been robust, growing every year since the agency began tracking complaints. The last two years have seen pretty significant jumps in the volume of complaints filed against creditors and debt collectors. BBB is perhaps the most surprising stat after what some might describe as the bottom falling out from under TCPA. 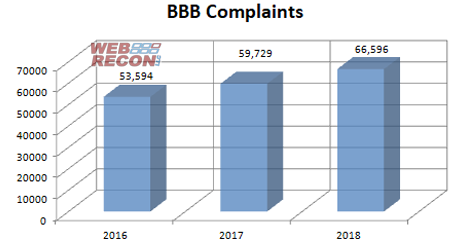 While we only have three solid years of data, they are showing very solid growth and a trajectory that might make debt collectors think about beefing up their BBB complaint response policies. Keep in mind, the BBB’s monthly numbers take a longer time than the other categories to fill in, so look for December’s BBB complaints to at least double, bringing the full year number closer to 68k. The BBB and CFPB numbers are still trickling in for the month so December numbers are tentative. But we don’t need to see the full numbers to recognize the dramatic growth in non-litigious complaints filed by consumers against debt collectors and creditors. For the month of December, every category was down from the previous month and from the previous year’s December (except FCRA suits). In other news, putative class actions were mixed last month with 19.5% of FDCPA, 20.2% of TCPA and 7.8% of FCRA lawsuits filed that way. And finally, Chicago attorney Nathan Volheim represented more consumers than anyone else in December (38) while New York attorney Craig Sanders has represented more consumers than any other attorney all year (456), retaining the title of most active consumer attorney of the year. Incidentally. Mr. Volheim is second on that list, having represented 427 consumer YTD. 1551 consumers filed BBB complaints, 3159 consumers filed BCFP complaints, and about 984 consumers filed lawsuits under consumer statutes from Dec 01, 2018 to Dec 31, 2018. Of those cases, there were about 984 unique plaintiffs (including multiple plaintiffs in one suit). Of those plaintiffs, about 313, or (32%), had sued under consumer statutes before. Actions were filed in 152 different US District Court branches. About 678 different collection firms and creditors were sued. There were a total of 1551 BBB complaints from Dec 01, 2018 to Dec 31, 2018. That is down -53.0% from last month. There were 3159 complaints filed against debt collectors from Dec 01, 2018 to Dec 31, 2018. This includes 3058 (97%) timely responses to complaints, and 101 (3%) untimely responses.